US stock indices give up gains. End in the red in up and down session. In an up and down day, the major indices are ending the session in the red, with modest (near unchanged) levels. The Dow and S&P had first 2 day losing streak in July but in reality today was hardly a down day (although it did give up earlier gains). 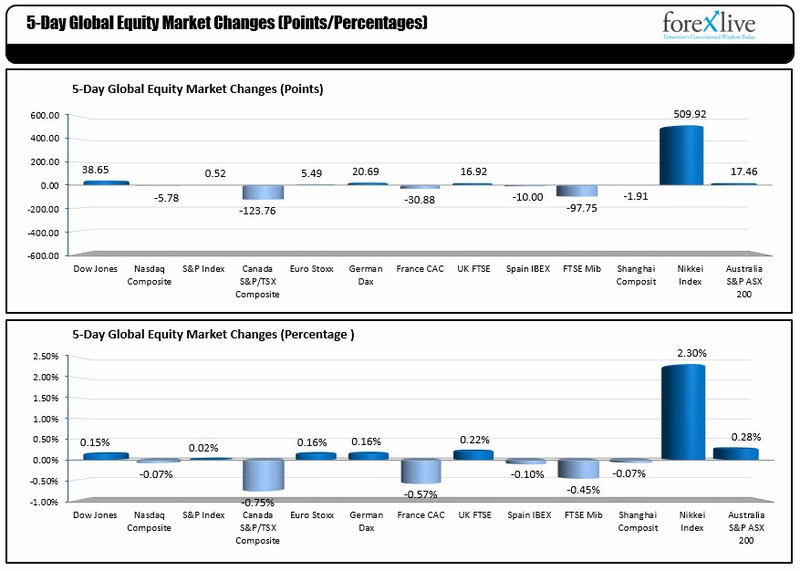 For the week, below are the price and percentage changes for the major global indices. In the US the Dow was up a modest 0.15%, and the S&P was nearly unchanged at +0.02%. The Nasdaq was down marginally at -0.07%. Juncker and EU are in the US to talk about trade. The Pres. started to lay the “expectations pipe” with comments this week. Then there is the China situation. It could be a volatile week.